Here is the final mini-session analysis for the first test between Bangladesh and West Indies at Shere Bangla National Stadium, Dhaka, Bangladesh. Chris Gayle started off with a bang, hitting the first ball for 6, but departed soon after. The real star of the day for West Indies so far is the much less flashy Nevisian opener, Kieran Powell. Powell has recently left his flashy stroke making behind, and has started to think like a boring but effective opening batsman. The result is that he has started to play in a boring manner, and do it effectively. While his strike rate of 65.7 may not look particularly boring, he has boosted that with an attacking spree just after bringing up his century, and was prepared to let balls go. During this innings he has the patience to play out 5 maidens. If he continues to bat with this discipline he could go on to a really big score. Powell was out right at the start of the session, but the master of being "boring but effective", Shiv Chanderpaul didn't let up. He advanced to 88 in his customary fashion. It took him 38 balls to reach double figures, but he has accelerated steadily since then, scoring at a strike rate of just over 70 since then. The game is closer than 4-1 would suggest, but West Indies are certainly in control. West Indies are looking like they are in form, and ready to go. Bangladesh are going to need to find an extra gear to keep up with them in this game. Chanderpaul has another century. This is number 27. I've been told that conditions in Bangladesh are quite similar to Guyana, so perhaps it should be little surprise that Chanderpaul looks so composed there. What ever the reason, Bangladesh need some early breakthroughs tomorrow to avoid this match turning ugly. It would be hard not to drop your head at this point if you were Bangladeshi. The one bright spark is that their new spin bowler, Sohag Gazi has been tidy. He's gone for less than 3 an over in his marathon spell of 42 overs. He has averaged about 46 overs per match in his first class career, and bowled more than 50 in each of his last two first class matches, so he's obviously fairly fit. Less exciting is that he was the last to take a wicket, in his 21st over. Since then there has been nothing on offer for the Bangladesh batsmen as the West Indians have applied the pressure. 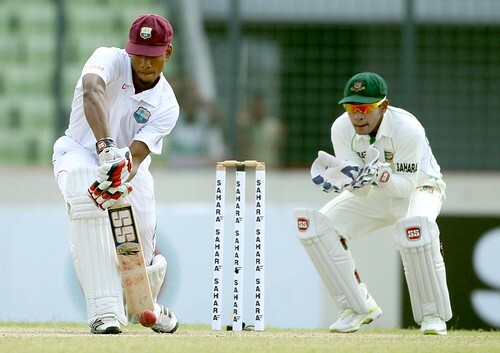 Bangladesh managed to exert some pressure on the West Indians, as an epic battle of wills started to evolve between Chanderpaul and Shakib Al Hassan. Probably the best player on either side, this is what test cricket is all about. It's safe to say that Chanderpaul is winning this battle, but how he goes later on when the conditions are more in favour of the bowlers is another story. In a match like this it is the battles within battles that are the most interesting. And Tamim Iqbal decides to have a turn. After a peculiarly timed declaration from Darren Sammy, Tamim and Shahriar Nafees went crazy at the top of the Bangladeshi innings. However this was different from Tamim's usual innings. At drinks he has 67 off 54, which is a very fast scoring rate, but not out of the usual for him. He has been known to score quickly in the past. The difference here is that of the 67 runs, 52 are in boundaries. Generally he gets a lot of his runs by running, and normally only half of his runs come in boundaries. This departure from his usual trend may be due to the fields that Sammy set for the new ball, or it may signal that Tamim feels like he needs to hit his way into form. Either way it's going to be keeping the crowd happy. Perhaps there is a game on here after all. A fairly quiet last hour. Tamim departed early and then Naeem and Shakib were content to accumulate slowly after that. My formula actually awarded that hour to the West Indies, but Bangladesh will certainly not be upset with 54 runs for 1 wicket so I called it a draw. A steady start for Bangladesh. They got through the potentially tricky start of the day and have made slow progress without losing a wicket. In some respect the way that they have ground this out is very promising. For too long Bangladesh have found impressive ways to lose. This stickability does them credit. Bangladesh are starting to impose themselves on the game now. These two batsmen are getting Bangladesh back into the match, in much the same way that Chanderpaul, Ramdin and Powell tried to bat them out of it. With the new ball approaching Bangladesh tried to increase the pace. They batted well, but lost Shakib. It was a risky shot, but a sensible risk. Now they will have to consolidate with the new ball approaching. The momentum continues with the Bangladeshi batsmen. Naeem Islam has his first hundred, and he has batted well for it. Bangladesh have avoided the follow on, and can now look at trying to look for a first innings lead. The game seems to be starting to advance quickly. However the match is still not looking likely to have a result unless something spectacular happens. Another hour where the scoring rate is roughly at a run a minute. It will be great if this pitch starts to disintegrate and there is a contest between bat and ball. At the moment it's a bit one sided. Just under 1000 runs for only 10 wickets. Five quick wickets, a potential injury to Chanderpaul and the pitch starting to play tricks means that this is game on here. Earlier Kieran Powell became the 56th batsman in the history of test cricket (and 8th West Indian) to score a hundred in each innings. He joins an impressive list: George Headley, Clyde Walcott, Lawrence Rowe, Rohan Kanhai, Gary Sobers, Gordon Greenidge, and Brian Lara being the previous West Indians to have achieved the feat. This game may well rest on how well the Bangladeshi top order go, because once Narine gets into their tail on this pitch the game may end very quickly. Bangladesh have taken the ascendency. Sohag Gazi, after being the first bowler to ever be hit for six of the first ball of a match, now has the best figures on debut for Bangladesh. Tino Best got out playing a defensive shot, a mistake that he is unlikely to ever repeat. Now West Indies will need to bowl well to avoid going 1-0 down in the series. What a cracker of a last day, after a fairly dreary first 4. West Indies and Bangladesh are both mixing up some very good cricket and some awful stuff. West Indies will want to take 4 wickets in the next 2 hours, to give Narine a crack at the tail in the final session. Tino Best is having a good day. He's possibly the most temperamental cricketer who is not from Pakistan. When he is having a good day, he really has a good day. This is not looking good for Bangladesh. After Tino grabbed his 4th, Verasammy Permaul has made his mark on the game on debut, with two big wickets. Mahmudullah is possibly the best number 8 in world cricket, but he has a lot of work to do, if he is to bat with the tail for the last 2 hours. Bangladesh have followed up a score over 400 with a score under 200, like they have every time except 3 that they have scored 400. Tino Best managed to pick up 5 in dismissing them, but the star of the match was easily Kieran Powell.